Our medium sized feather flag is perfect for any outdoor display. Standing over 3 metres high, they can draw the eye in from afar while gently blowing in the breeze. 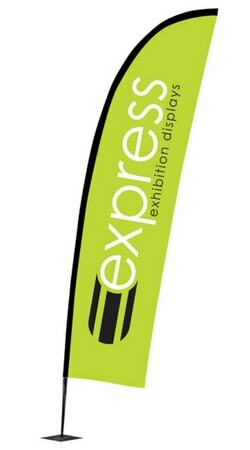 Perfect for outdoor events such as summer fetes and pop up promotions in town centres. Also great for advertising your retail shop location! Be prepared for every ground condition with bases, which are sold separately, including hard flat ground, grass, sand, soil and under car wheels.